Double high density foam stringers with glue lines, foam blank, Volan glassed with 1 1/2 inch rail lap. The fin maybe original, but amateur repairs have removed much of the rovings and it is probably reshaped due to damage. - black text and orange dot on white at rear sweet spot. Source : John Embery Collection, Shoalhaven Heads NSW. With Thanks. Purchased circa 1995 at garage sale, St George's Basin NSW. Repaired dings to nose, tail and bottom and fin. 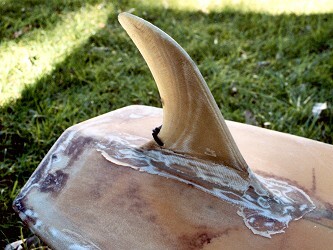 The fin maybe original, but is probably reshaped due to damage. Amateur repairs have removed much of the rovings, replaced with fibreglass cloth patches. As a result of damage and repairs, the fin is not straight. 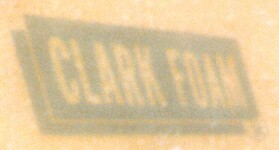 A circle silhouette on the tail probably indicates surf craft registation label, possibly Randwick 1968-1969.
circa 1967 the Dot decal was introduced. circa 1968 , the factory relocated to 164 Alexandra Parade Alexandra Headland, after a fire. continued to kneel paddle, although average surfers could only paddle these boards prone. above the base, many show warp or twist. 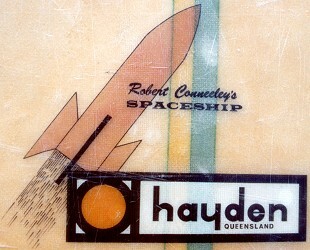 Decals were larger, more colourful and psychedelic/art deco in design, for example the G$S deck decal. A classic design of the period by a noted surfer. The double foam stringers are unusual, and probably intended as an indication of quality. I am unaware of the brand being manufactured in Australia. Also noted on #303. The Australian Surfer's Journal, Volume 3 Number One , Summer 2000. pages 24 to 237.